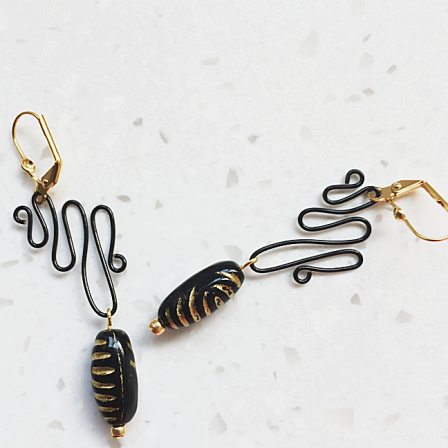 Bohemian style statement earrings made up of handcrafted abstract motif with Artistic Wire® (non-tarnished , permanent coloured wires) in black and Czech table-cut beads. Length - 6.7 cm. 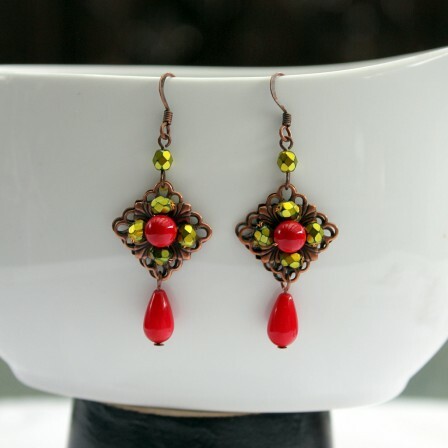 Bohemian style statement earrings made up of handcrafted abstract motif with Artistic Wire® (non-tarnished , permanent coloured wires) in antique brass and Czech table-cut beads. Length - 6.5 cm. 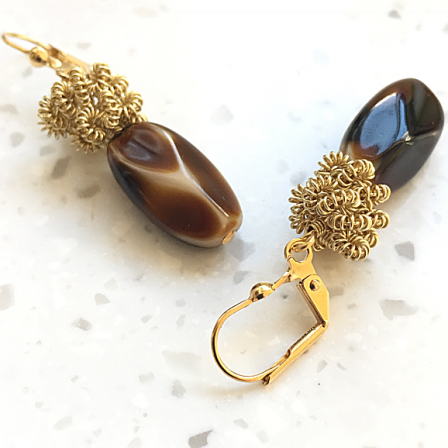 Elegant vintage style earrings made up of brown/beige German Vintage glass beads and gold Artistic Wire® (non-tarnished , permanent coloured wires) coils. Drop - 3.5 cm. Length - 4.7 cm. 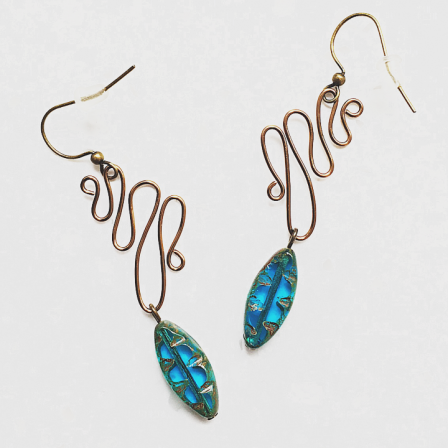 Gold-plated ear hooks. 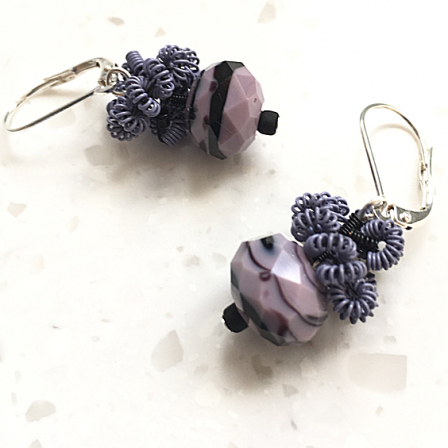 Delightful and fun art-deco style earrings made up of black/mauve faceted glass beads and matt mauve Artistic Wire® (non-tarnished , permanent coloured wires) coils. Drop - 2.2 cm. Length - 3.4cm. Silver plated ear hooks, which can be replaced with sterling silver ear hooks with an additional $5. 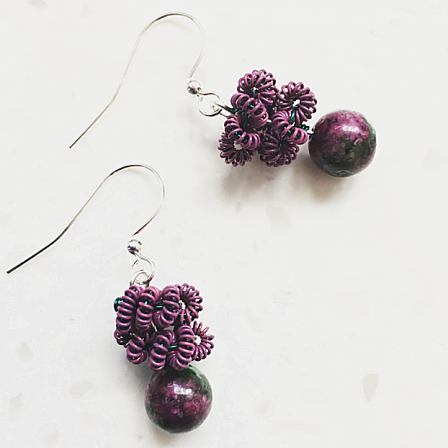 Delightful and dainty earrings made up of ruby zoisite beads and matt purple Artistic Wire® (non-tarnished , permanent coloured wires) coils. Drop - 2 cm. Length - 3.2 cm. Silver plated ear hooks, which can be replaced with sterling silver ear hooks with an addition $5. 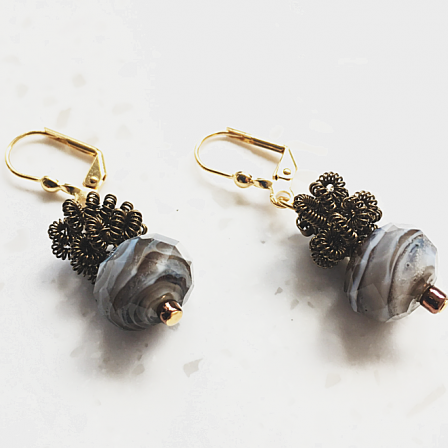 Charming vintage style earrings made up of greige faceted glass beads and antique brass Artistic Wire® (non-tarnished , permanent coloured wires) coils. Drop - 2.2cm. Length - 3.4cm. Gold- plated ear hooks. 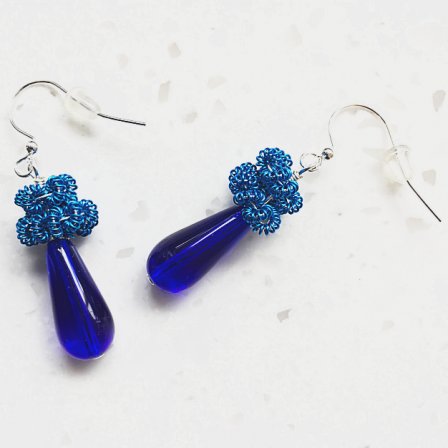 Delightful and fun art-deco style earrings made up of cobalt blue tear drop Czech glass beads and silver blue Artistic Wire® (non-tarnished , permanent coloured wires) coils. Drop - 3.4cm. Length - 4.6cm. Silver plated ear hooks, which can be replaced with sterling silver ear hooks with an additional $5. 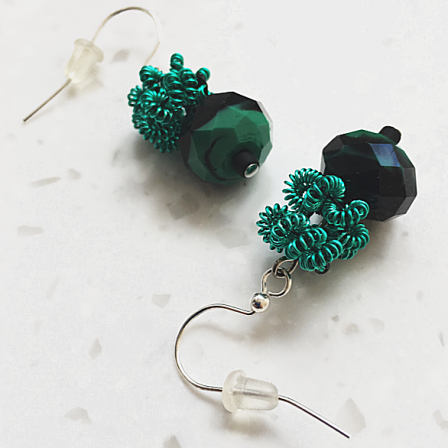 Delightful and fun art-deco style earrings made up of black/green faceted glass beads and kelly green Artistic Wire® (non-tarnished , permanent coloured wires) coils. Drop - 2.2 cm. Length - 3.4cm. Silver plated ear hooks, which can be replaced with sterling silver ear hooks with an additional $5. 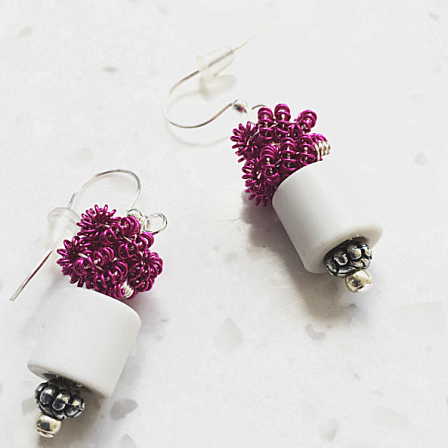 Delightful and fun art-deco style earrings made up of white cylindrical porcelain beads and fuchsia Artistic Wire® (non-tarnished , permanent coloured wires) coils. Drop - 3cm. Length - 4.2cm. Silver plated ear hooks, which can be replaced with sterling silver ear hooks with an additional $5.